Yes, the dredging is impressive. That is to be expected when it is the case of two billion euros and the largest construction project of its type in Europe. But, as of September, 2018, Portier Cove is much more than an ambitious plan about conquering and living in harmony with the sea. 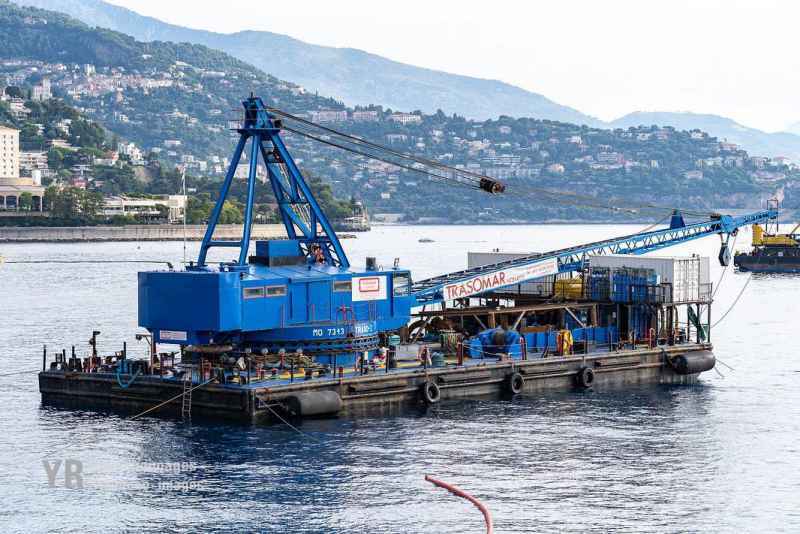 Everyone during the daytime in Monaco over the last month will have seen the giant five-thousand-ton box-shaped foundation stone floating offshore near Larvotto. Thirty metres square and twenty-six and a half metres high, it has loomed like a Lego monster since July. Almost ominously, have you noticed, it has disappeared. That foundation stone, which is a specially designed reinforced concrete box, is now part of the new extension of Monaco. It has been submerged and secured in place at Portier Cove. That is a giant stride, and it forms the anchor point to which all the other seventeen foundation stones will be linked in order to form a secure reinforced-concrete belt. The complete band of caissons. Apollo landing on the moon; the key foundation stone locked in place in Portier Cove – both events have enormous significance. Simplicity is in the eye of the beholder; it might be better said “only in the eye of the beholder”. What is made to appear like a game of Lego is in fact sophisticated engineering. It is the same in sport. Great athletes make their feats seem effortless. Getting that first foundation stone in place, and anchoring it, took advanced science and engineering. There is no guesswork. Imagine a hot air balloon and then imagine the opposite. Instead of jettisoning ballast to make the balloon lighter to rise up, with the foundation stone the engineers need to sink it. They need to add ballast, which they do by pouring water into the concrete blocks – but there is a required symmetry to the process, in order to lower it steadily and accurately into the exact location. Exact is the operative word. There is a maximum allowed tolerance of 20 cm, so there is a GPS locator incorporated into the foundation stone. What can go wrong? Well, the weather and sea must be perfect. And in the middle of the lowering operation the sea current did become too strong. The engineers wisely paused overnight and then the following morning secured the stone in perfect alignment. Once there, additional steps are taken to anchor it. Sand is poured in to add weight. July 2019 is the target for the concrete belt of eighteen giant foundation stones to be in place – at a rate of two a month the deadline is achievable. The depth is twenty metres and the stone is twenty-six and a half metres high – which means it will create a promenade six and a half metres above the sea, just as the architects have planned. 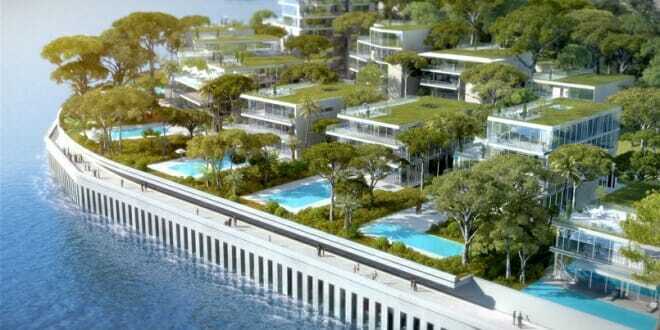 For the next few months, for all of us excited about Monaco growing in harmony with the sea, we can watch it happen. It is a case of observing a rhythmic process out in our Ocean. 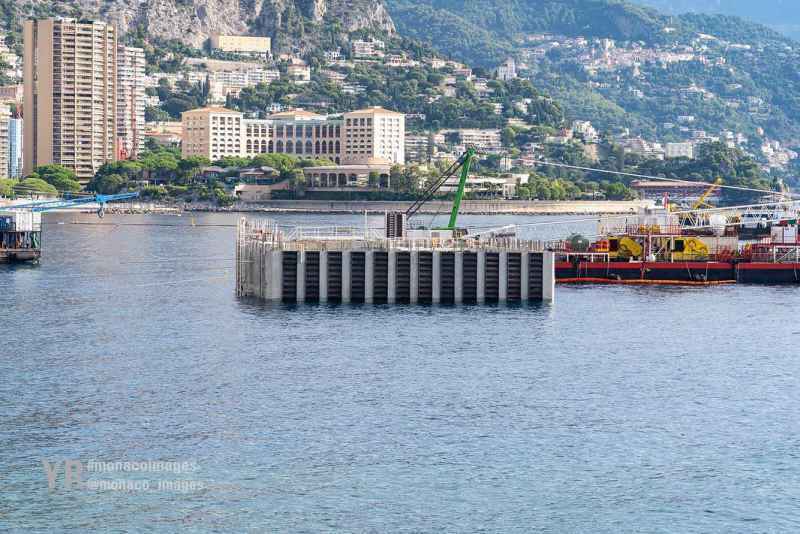 These giant foundation stones will be floated to Monaco from Marseille and sunk carefully into position to create the sturdy concrete belt around Portier Cove. Poetry in motion one might say.